VIPs have a number of applications throughout the world, including refrigeration equipment, vending machines, shipping containers and construction. A few companies are manufacturing them in the United States, including Nanopore and Dow Corning. 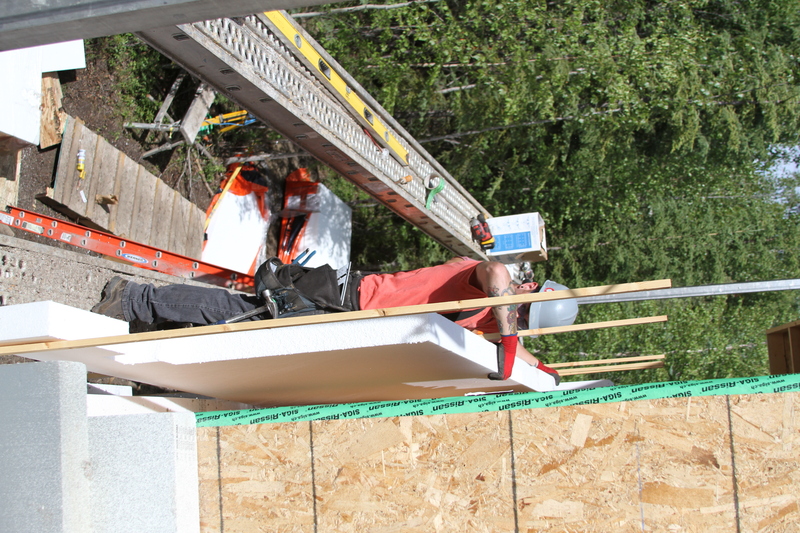 The new engineering building at the University of Alaska Fairbanks will use Dow Corning VIPs in a test wall system, which consist of fumed silica (basically glass powder) wrapped in a layer of plastic and aluminum. In effect, the plan is to replace some EPS foam in the wall system with a small vacuum panel. 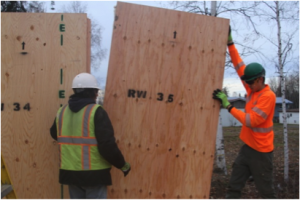 UAF researchers are planning to measure the installed R-value of the panel to study its appropriateness for buildings in our climate. 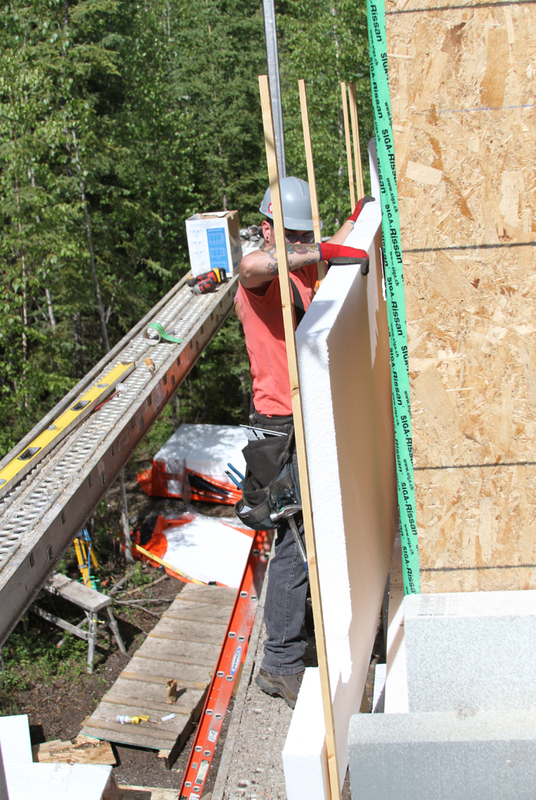 Posted in Ask A Builder and tagged alaska, building, CCHRC, cold climate, construction, fairbanks, vacuum insulated panels, VIP on September 15, 2014 by mrettig. The skilled craft of timber framing remained common practice until the early 19th century, at which point both milling and construction methods shifted to machines and mass production. Advances in technology, such as large powered circular saws, enabled mills to quickly produce large quantities of smaller dimensional lumber, which could be more easily transported. 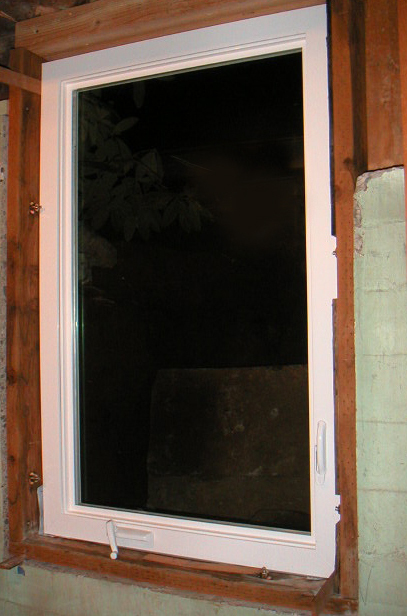 In turn, mass produced smaller framing members made it possible to erect a home with only a small team of builders using “stick frame” construction techniques that remain relatively unchanged to this day. 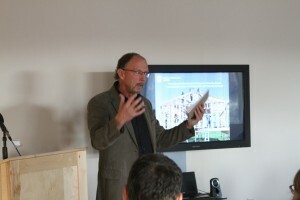 While timber frame construction is still in use, it has evolved from the purely practical construction technique that it once was. 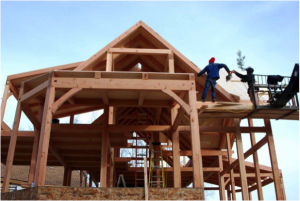 Originally, timber framing was primarily structural, however in today’s homes, timber frame construction is also used to showcase the aesthetics of the timber frame substructure, since it remains exposed towards the home’s interior. Many different tree species can be used for a timber frame, including Douglas fir, Sitka spruce, Eastern white pine, red cedar, oak and Interior Alaska white spruce. The trees are handcrafted or milled into large beams. 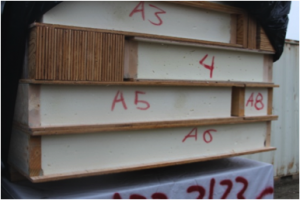 In the United States, there are several suppliers who cut custom beams according to a computer-aided design plan sent to them by a builder. At the building site, the beams are assembled into a structural frame that is fastened together with a combination of carefully fitted interlocking wood joints and wooden pegs and splines. In a traditional timber frame, metal connectors of any kind are seldom used. 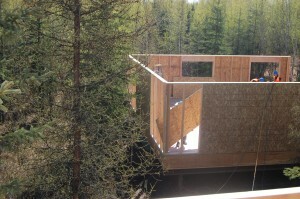 A completed frame will contain combinations of dozens of types of joinery that make it unique. For instance, some substructures are built like wooden furniture, where the connecting beams use mortise and tenon joinery, a process through which two beams are cut so that one has a square or rectangle opening (the mortise) into which the other beam (the tenon) fits exactly. 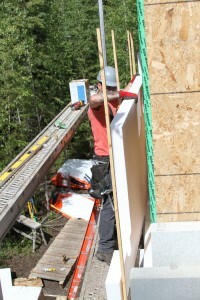 After the timber frame substructure is erected, it is enclosed, often using structurally insulated panels (SIPS), to complete the home’s envelope. Most timber frames homes have open interior designs to showcase their exposed architecture. 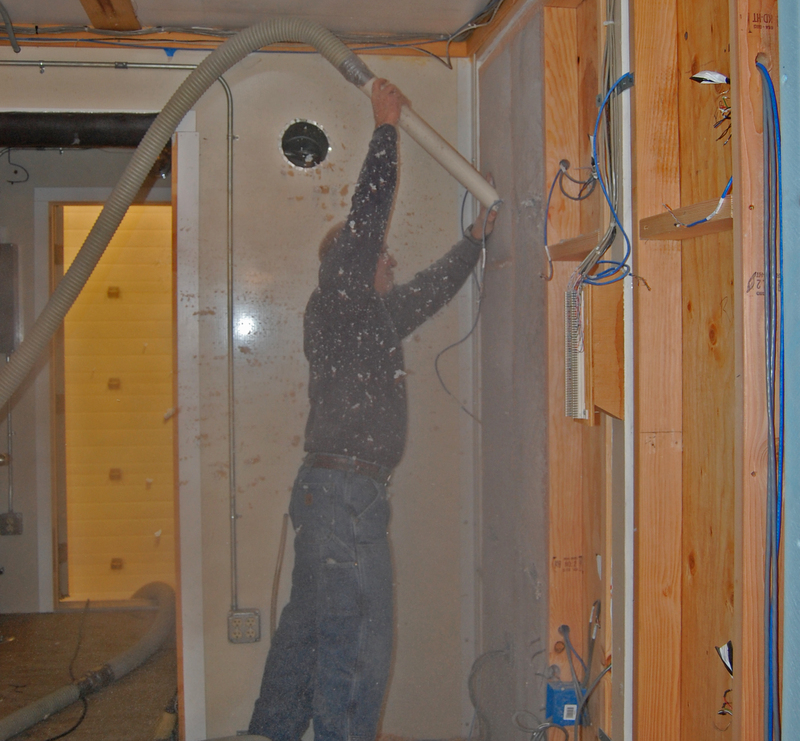 Plus, interior walls are not needed for structural purposes. 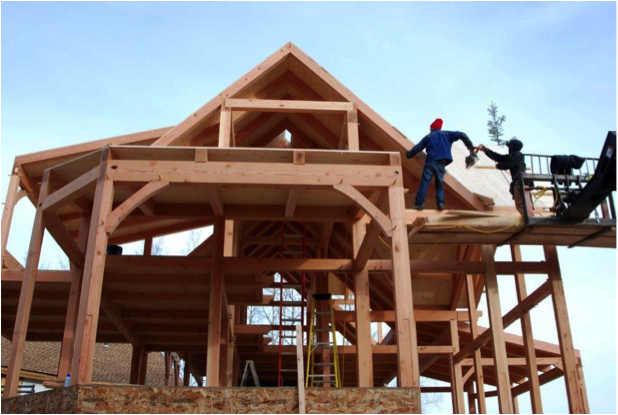 Today, timber frame construction fills both a practical and artistic role in the building community by crafting a home that is both a shelter and a work of art. 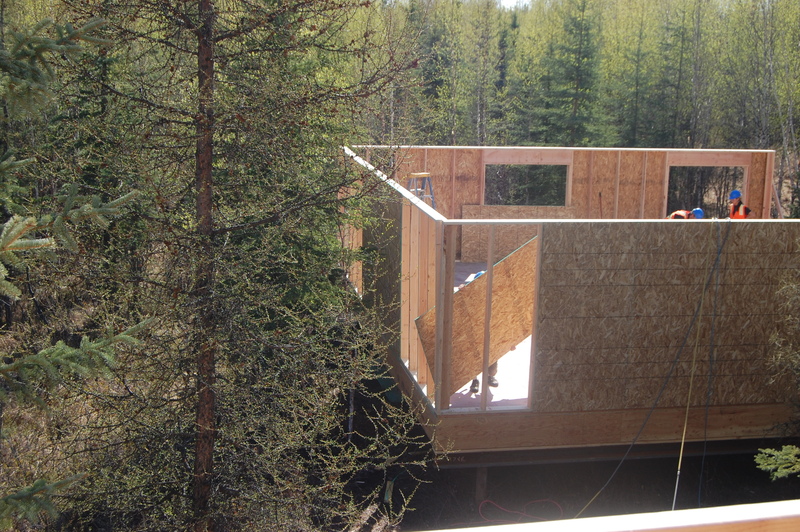 Posted in Ask A Builder and tagged alaska, building, CCHRC, cold climates, construction, fairbanks, timber frame, timber frame construction on July 24, 2014 by mrettig. An arc fault circuit interrupter, or AFCI, is designed to detect dangerous electrical arcs and disconnect power to the circuit before a fire starts. They contain current and temperature sensors as well as a microprocessor that can distinguish arc faults caused by unintentional electrical hazards. An arc fault is the unintentional flow of electricity between two separate wires. This electrical discharge can create enough heat to further break down electrical insulation and start a fire, especially if nearby objects are flammable, such as a wooden floor, wall or piece of furniture. For instance, an arcing fault might occur in a power cord that has been damaged (for example, crushed beneath a piece of furniture). The damaged insulation could enable electricity to jump across to a neighboring wire within the cord and build up enough heat to start a fire. Arcing faults can also occur in power cords where the insulation has cracked due to age – or in electrical wires inside a wall that have been accidentally pierced by a nail. According to the Electric Safety Foundation International, arcing faults are responsible for 30,000 home fires each year in the United States. These types of fires can be prevented by installing AFCIs. 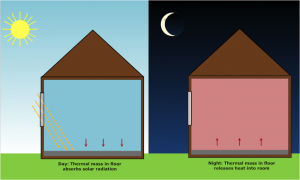 In new homes, AFCIs are now required in the living room, bedrooms and dining room. There are three types of AFCIs. The most common, a branch AFCI, replaces standard circuit breakers in your home’s service panel. Branch AFCIs can detect an arc-fault in the circuit from the panel to the outlet and thus will shut off electricity to that branch circuit. Outlet AFCIs provide arc-fault protection to devices plugged into that outlet. Combination AFCIs are a more advanced technology that can detect additional kinds of faults, such as an arc within a single wire due to a loose connection. Does your home have AFCIs? You can check to see if your home has AFCIs by looking at the outlets and the circuit breakers. An AFCI outlet and circuit breakers will be labeled as such and have a TEST button on them. AFCIs are not to be confused with ground fault circuit interrupters (GFCIs), which also have a TEST button. GFCIs are another type of electrical safety device that detect current imbalances caused by a current leak, which can occur in the case of electric shock. They are required in bathrooms and kitchens and are often installed in other locations with water exposure, because moisture increases the risk of electric shock. GFCIs protect people from electrical shock and AFCIs protect structures from fires. If you have AFCIs installed, they can be tested by pushing the TEST button. If the circuit trips, then the AFCI is working. To reset the AFCI, first turn the breaker to the OFF position. Then you will need to flip the breaker back to ON. If the circuit does not trip, the AFCI should be replaced. AFCIs can be installed by a licensed electrician and typically cost less than $50. For more information about AFCIs and other electrical safety devices, visit the Electrical Safety Foundation International’s websitewww.esfi.org . Posted in Ask A Builder and tagged AFCI, alaska, arc fault circuit interrupter, electric safety, Electricity, fairbanks on July 7, 2014 by mrettig.